The Spirit-filled life … like wind in your sails. 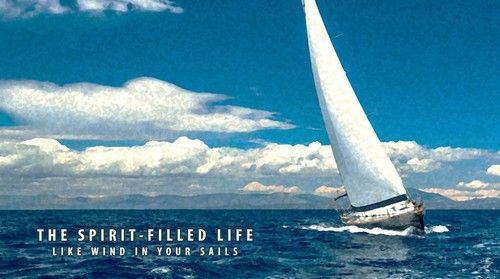 As the wind fills the sails, so the Spirit fills us, and empowers us to live a joyous and dynamic life, in a day-by-day and moment-by-moment relationship with God. It really is possible! Because the moment a person believes in Jesus, a person is immediately filled with the Holy Spirit. By faith, a child of God. New life, new identity, new purpose, new power. The Holy Spirit means God with us and God in us, once and for all, forever. Yet, there is also a daily responsibility to “be filled with Spirit” (Ephesians 5:18). There must be a daily yielding to the Holy Spirit and a fresh empowering of the Spirit in our lives. So, where is the power today? The book of Acts records stories of incredible power, stories that make us long for that same power. Too often, the fullness of the Holy Spirit is missing in many Christians today. Historically, that longing has led to some serious theological error. As we pursue the filling of the Spirit, we must be biblically grounded in our understanding of the Holy Spirit and avoid charismatic error and excess. Jesus called the Holy Spirit “the Helper,” and we need His power. To help us resist temptation and live a godly life. To give us gifts and abilities with which to serve Him. And to empower us as confident witnesses of the Gospel. This is the true evidence of the Spirit-filled life; seen in character, service, and sharing the Gospel. The Spirit-filled life … like wind in your sails.